Kalifornia Love: If You're Going To Smoke, Please Don't Blow It In Your Baby's Face.. If You're Going To Smoke, Please Don't Blow It In Your Baby's Face.. I feel like I've been ranting a lot -I'm sorry! (I promise to do more reviews too if that helps.) It's just that some people can be so STUPID and brainless. A few days ago, I was shopping and I saw a young couple (early 20's) walking with their baby (he looked to be under 2 years old since he was still a wobbly walker.) To me (and I'm sure most would agree), I feel that kids, especially your own or your siblings, should be very protected -you don't want to expose them to any dangers you know? You, as a parent or big sister/brother, should be their "protector" and be able to provide them with a safe environment. Anyways, the 3 of them were walking in front of me hand in hand. The next thing I know, the idiot mother takes out a pack of cigarettes and proceeds to blow the smoke in her kid's face. She probably didn't realize it, but she would inhale the smoke and then exhale right down at her kid. THEN, she gave the dad a cigarette and he started doing the same thing!! They just really could've blown the smoke in another direction and NOT in their baby's face. Man, you have no idea how much this pissed me off. Second hand smoke anyone?! I don't have anything against those who smoke but if you're going to do it, please don't do it around children and expose them to it too -you have a choice, they don't. 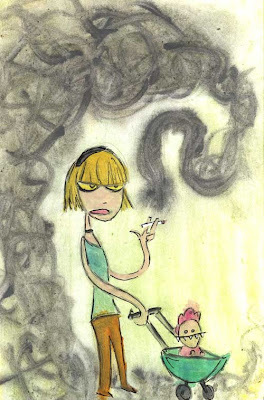 If you want to slowly kill your own lungs, then so be it but don't kill your kid's too. And if you must smoke around your baby (which I really doubt is a must), don't do it in the poor kid's face! My goodness, I wanted to say something but it really wasn't my place. Oh my god I can't even imagine how angry I would be. Those parents are horrible. My parents are all smokers, but my stepmom quit smoking both during her pregnancy and up until my little brother was 5 because she knew just how bad it was on his little developing lungs. Now when they smoke it's outside so he has as little exposure as possible. @ Melly.. Glad we're on the same board. =) I'm not a mommy but I'm a big sister/cousin and pretty protective so I can't stand when I see things like this! @ Andi.. I know! Totally horrible. That's great your stepmom quit for the sake of your little brother. I agree that it's also important to keep the smoking outdoors and not inside the house -I've been to houses that were filled with cigarette smoke and it scares me for the kids' sake. I definitely get what you mean about young parents. Sure there are some good ones out there but if you don't know how to be a parent yet, don't have a kid and be responsible when you're sleeping around! I feel bad for the kids too -I mean that's exactly why I myself wouldn't WANT to have a child right now -because it wouldn't be fair to the child. I wouldn't be able to give the fully give the kids what they need as it takes SO much to raise a child -time, money, etc. I really, REALLY wanted to say something Erynn and usually, I would. The thing is though their son was right there and I didn't want to seem like "the bad guy" who's "attacking" his parents. I know if I was a little kid and someone scolded my mom or dad, I'd be sort of scared and confused. I got pregnant when I was sixteen, did a positive on my 17th birthday.. And my daughter is the best ever birthday "present" I've got. I was scared, as hell, because my own parent was never a good one to me or my sisters. Anyway, I believe almost every mother has the opportunity to grow as a person to be a mother when pregnant, like I did, but I've also seen a lot of young unfit mothers, who just can't accept the fact they have something more important in their lives than partying. Being a young mom hasn't been easy either, but I'm going back to school next month, after wanting to spend the first years of my daughter's life with her, to see her first steps and so on. I understand perfectly well why we are judged so bad, because there are so many bad examples of young parents, but I take proud to say my daughter is happy, confident and social little girl :) We might have been tight with money, but she's never lacked anything crucial, neither have I. And like I said before, I'm going back to school, far more motivated than ever before, to get myself the education I want so I can in the future, get better jobs and therefore better tools to provide my daughter more financially stable situation. Melly, thank you so much for sharing your story. You are a great example that there CAN be good young parents out there. I totally understand what you mean by some young parents not being able to accept that once a baby is in this world, they can't seem to grasp that there is someone more important than themselves. I've never been in your shoes as I've never been a mom myself but even being an older sister, I have to give up hanging out and "being a college kid" sometimes so I can take care of my siblings. You're right, every parent does have the opportunity to grow but some just find it harder than others. They may not be used to putting themselves before another human being. It's wonderful that you're going back to school and it's smart that you're preparing for you and your daughter's future. It's perfectly acceptable that you'd want to be home with your daughter for her first few years -I'd likely do the exact same. Every mother wants to see their child's first steps, here the first words, etc! It's so refreshing to hear from a young, but responsible mom. You may not have all the money in the world, most families don't, but the time and love that you give her are more important than anything money can buy. My Beloved Jack Black Lip Balm & How To De-Tube! Olive Oil as Makeup Remover? Shu Uemura, You're Still Here? We Can Make A Difference.. Sign The Petition! MAC Venomous Villains! Update with Promo Pic!